Wonderful travel memoir! Interesting narrative packed with Mayan history (in a very readable format). For starters, this is a most beautiful book--with its glorious cover photo and the illustrations of traditional Maya icons that preface each chapter. It's so rare to have pictures in adult books! But a book is the words, and how marvelously Mary Jo McConahay knits them together. Some of her images I will not forget--e.g. "at the nape of the neck, where the hair was gathered, each woman wore a clutch of dead birds. Those birds just hung there form the knots where the long, black hair had been pulled together, lushly colored dead birds that must have been somehow magically preserved, whose wearing marked the women as natural members of the forest, yet its conquerors, too, a race of queens. "Reading this travel memoir allowed me to enter strange places where I might not have the courage to go; it helped me to understand the politics that have made life so precarious for the Maya; it made me aware of the great beauty of creation. Pity and terror--that's what the ancients thought made for tragedy. There's plenty of both in this book. In these alluring and forbidding Maya Roads, McConahay is a trustworthy guide. And the book is "a page turner" to boot. After one hundred pages I quit reading Maya Roads. At my age I do not have time to spend on things that do not hold my attention. Mary Jo is an accomplished journalist and filmmaker who was a witness to Central American civil wars during the seventies into the eighties. 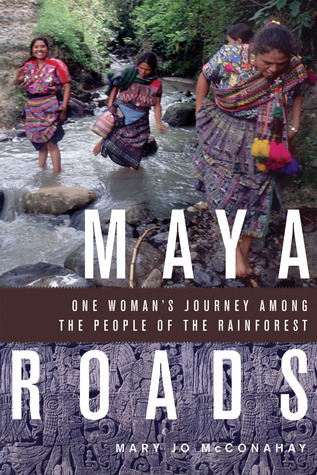 Maya Roads is a unique kind of memoir in which she tells us about maya culture, history, language and philosophy through her varied personal experiences in Guatemala and Mexico in Maya countryside. I love how she tells us those stories: she went first as a tourist, then as a participant in an archeological dig, and then a long period as a journalist, with a final role as tourist again, but with a purpose, still documenting and recording history. It has, in fact, been classified as a 'travel' book, for which she won the Best Creative Nonfiction Book of the Year -- 2012 Northern California Book Awards. To me this is only one facet of a well written book. What has happened to the land and the people with the drug cartels is truly tragic, in so many ways. I like that she does not impose her POV on the reader. We are left to think about and perhaps research further what she tell us. Kudos to Mary Jo! I understand she is hard at work on a new book, non-fiction, on a totally different subject. Am looking forward to it! (kindle) A very interesting account of the authors travels throughout the jungle of both Southern Mexico and Northern Guatemala, over the last 30 yrs., starting with her fascination with the Lacandon Indians in Mexico, when she was in her 20's. Besides her trips to visit the amazing Mayan ruins throughout the area, she has given us an eyewitness descriptions of some of the most important happenings in the area including war and the aftermath of massacres, and today's drug lords. Her description of the area, the people, animals a feeling of the jungle really makes one feel as if they are riding along with her on those long bus rides. Each chapter is sort of an essay on a particular experience or story the author pursued. She writes well and really knows her subject. I had a hard time getting a visual in my head of some of the places she described so I resorted to google image searches. I'm not sure if that's a defect of her writing or a conservative imagination who is aware of the stereotypes that could be guiding it. If I had read this as a teen or undergrad student she probably would have had a major influence on my perception of Central America (which instead has been carved year after year by American media). I wish I could say I loved this book. I wanted to. The author is a professional journalist who documented Central and South American wars, etc. It kind of reads like a National Geographic article...and at times I found myself lost, wondering if she had explained something and I had missed it, or perhaps she just assumed I had a previous knowledge of all of the atrocities that occurred on Guatemalan soil. I certainly learned a lot, although it also brought up so many other questions that I felt were unanswered...so I will have to do some more reading to make sense of it all! This book should be right up my alley. Maya, Guatemala, discovery--and all in a year when Mayans matter LOL. But it's a hard year for me and books, and I just could not get into this. I'm not sure if it was the pacing, the style, or just my own lack of interest once I got started, but I abandoned this about three (long) chapters in. Others may like it. Maya Roads is an engrossing book, one of the best works of travel journalism I have ever ready. The author spent 30 years living and working in Guatemala as a journalist and war correspondent. Her love for the land and for the people is evident in every page. Her passion for social justice infuses the entire book. One of my favorite books that I read in 2012. Nonfiction but it's like reading an extremely well written adventure story which is true, poignant, sad, informative and up lifting. The subject matter is very dear to my heart since I was very involved with Guatemalan Maya refugees and Central America and visited some of the same places. Very interesting book written about a woman who did extensive traveling thru Mexico, Guatamala and Beliz over 30 years because of her interest in the Mayan People and history. This will make you wantto take a trip. Loved her vivid descriptions of the rain forests. A wandering travelogue over a period of 20 years. Some parts were engrossing, others not so much. The author seemed fearless travelling alone into untravelled and sometimes dangerous areas of Mexico and Guatemala. This book was a great memoir but the presentation of historical facts is found more logically lain out elsewhere. Very good information. Most upsetting - how US policies did not take into account the native people. Very interesting life story. This made me want to visit the Maya pyramids in southern Mexico this year. Beautifully written book about the author's return to Mayan areas near Chiapas, Mexico and the Peten area in Guatemala that she had visited many years before. I learned a lot and loved her story. Thoroughly enjoyed the journey of this lady as she traveled through this remote area. Mary Jo McConahay - Mary Jo McConahay is the current Lowell Thomas Travel Journalist of the Year, considered equivalent to the Pulitzer Prize in the Genre. She is author of the new Ricochet, Two Women War Reporters and a Friendship under Fire, and Maya Roads, One Woman's Journey among the People of the Rainforest. Maya Roads is a National Geographic Traveler Book of the Month, winner of the Northern California Book Award for Creative Nonfiction, three Independent Book Awards including best new nonfiction book, and named Best Travel Essay Book by the Independent Publishers Awards. A journalist, Mary Jo is also a documentary filmmaker and offers a yearly writers' workshop on Lake Atitlan in Guatemala.